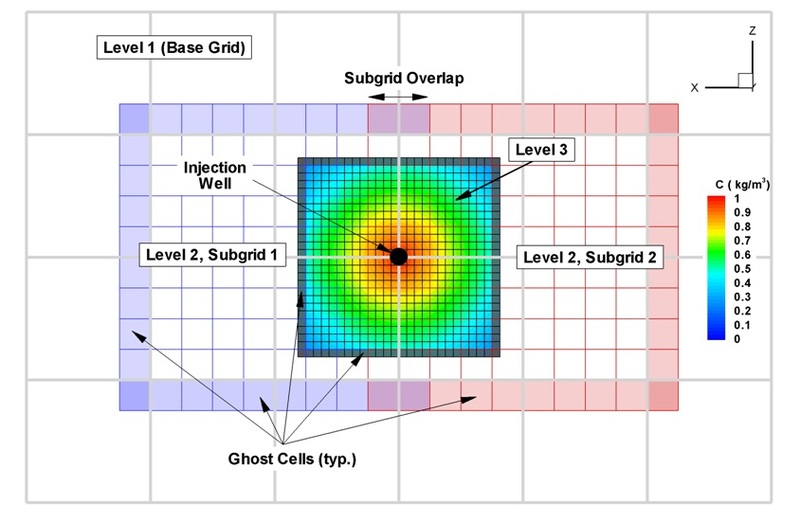 Adaptive Groundwater is an advanced three dimensional groundwater flow and transport simulator with features such as dynamic adaptive mesh refinement (AMR) and multi-threading. 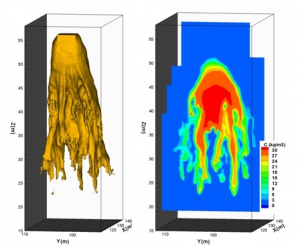 Adaptive Groundwater is a software program which uses highly-scalable, three-dimensional numerical code for high-resolution simulation of groundwater flow and solute transport problems. 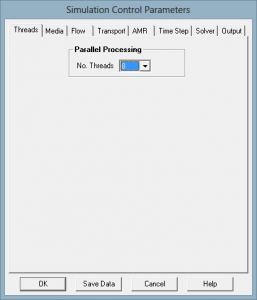 Dynamic adaptive mesh refinement (AMR) and multi-threading are used to automatically generate unstructured grids to handle multiple scales of flow and transport processes. 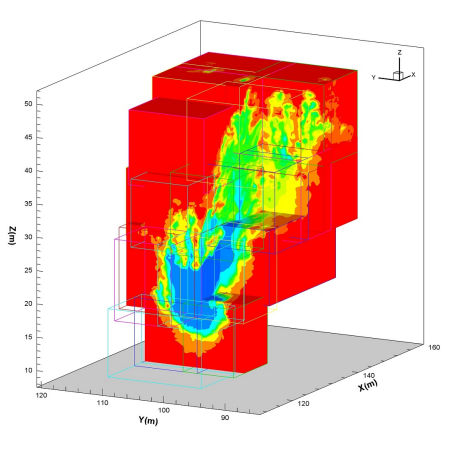 This is done by translating and adding/ removing telescoping levels of progressively finer subgrids during simulation. 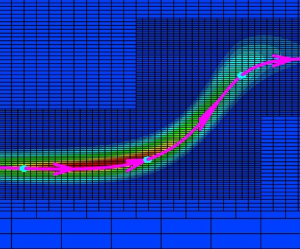 Adaptive mesh refinement (AMR) techniques dynamically redistribute the nodes on a computational mesh in such a way that physical phenomena can be resolved accurately and efficiently in space and time (Gamliel and Abriola, 1992). 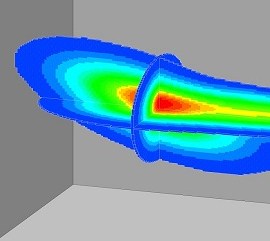 he Simulation Control Parameters Dialog defines input parameters that control the numerical mesh design, simulation time step, flow and transport equation solution accuracies and other simulation control parameters. With Adaptive Groundwater, hydraulic conductivity (K) may be assigned either as homogeneous K zones or a correlated, lognormally-distributed random K field. Adaptive Groundwater initial conditions include concentration and hydraulic heads. 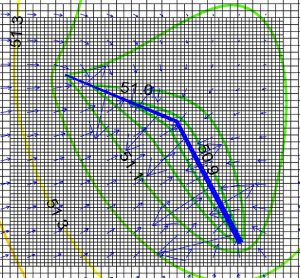 Adaptive Groundwater boundary conditions are assigned independent of the mesh geometry. Adaptive Groundwater computes groundwater pathlines that start from User-selected starting coordinates. 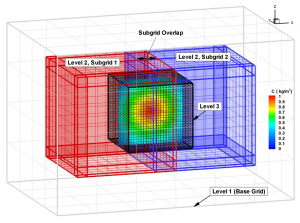 Adaptive Groundwater offers numerous options for visualization of model input and output. No, Adaptive Groundwater must be physically shipped and is delivered with a USB dongle. How is Adaptive Groundwater licensed? Adaptive Groundwater is licensed using a USB hardware key (dongle). Click this link to download a case study covering Code Verification of the Adaptive Groundwater program. Click this link to download Adaptive Groundwater tutorials in a PDF format.